In fact to be more precise; a lazy day on and by the magnificent beach of Klong Dao near Saladan Town. 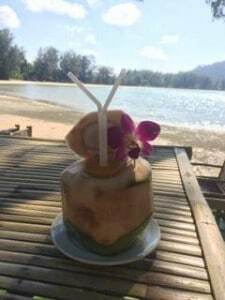 I took a barefoot walk to the far end of the beach where I had a fresh coconut 🙂 then it was back to the Bee Garden for a two hour massage by the beach the first hour devoted to my feet the next hour to be massaged with coconut oil. I guess I will soon be a coconut. I’ve now found there is a ferry from this island to Koh Lipe where I can stay the night then a ferry to Langkawi Island which is in Malaysia followed by a ferry to Penang which is connected to the Malay mainland. According to bikemap.net from there to Singapore is 760km so about 10 days at a relaxed pace.